Lifting my head from my busy life to post. Yesterday I wrote down my list of releases and my deadlines from now until next fall. OMG! I'm one busy lady. I have another Allyson James book that will be out next spring, but no pub. date yet. 3. Finish writing a short Christmas story by Nov. 21. Hmm, Thanksgiving and Christmas are coming up, too, aren't they? Afraid I'll have to skip them this year too, I guess. On the other hand, Hawaii was wonderful. I did a little bit of writing and a lot of reading. That hot rock massage was pretty darned good, too! Hello, I'm back! Maui was wonderful, as I suspected. 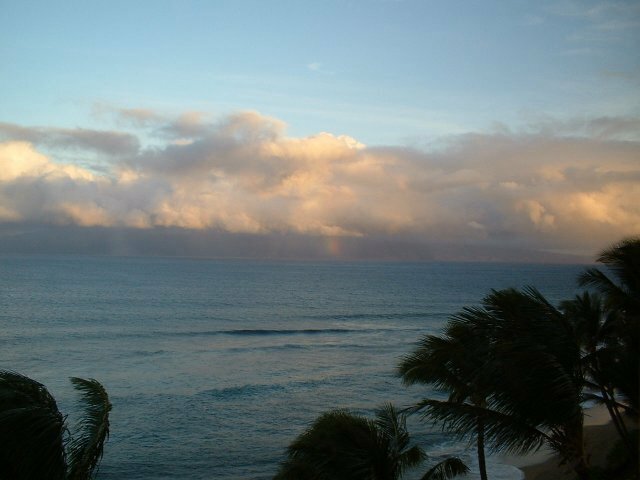 I stay in West Maui along the coast overlooking Lania and Molokai, and I have to say it's a great place to decompress and de-stress. I was a wound up, insane fool when I left, now I'm all mellow. And sick. I don't know if it's flu bug (but I don't have a fever, so maybe not), or food poisoning. My dh and I ate mostly the same food (we like to split entrees at restaurants because portions are huge), although I probably had a few things he didn't. Anyway, let's just say I'll be in the bathroom a lot today. Sigh. Still, Maui is a sensual place, relaxing, and rejuvinating. The hot rock massage I got didn't hurt either (warm, smooth rocks rubbed over your body and placed along certain points. 60 minutes of bliss). I'm working my way through a ton of email, and my spam washer at some of it :-(. If you sent me a fan mail in the last week, and I don't reply, you can send me another letter if you want to bother, and I'll get right back to you. I was reading mail off the server and saw that a couple of people really enjoyed Confessions, but when I processed the mail when I got home, it was lost somewhere. Sorry! But thank you for writing! I won't be posting for a while, so here are some pretty pictures for your viewing pleasure. First one is Molokai, viewed from Maui. Next, Lanai, viewed from Maui.